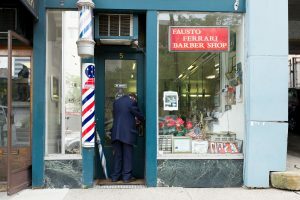 In 2016, the Fausto Ferrari Barbershop on Garfield Place downtown at Piatt Park caught its second wind. 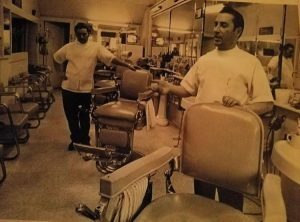 After five decades of cutting hair, 92-year-old Fausto Ferrari decided to hang up his clippers and hand them down to his grandnephews Tony and Austin. 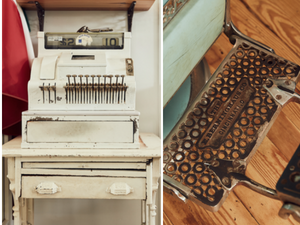 While the third generation of Ferrari brothers are gently breathing new life into the place, everything from the vintage chairs to the cash register serves as a constant reminder of the barbershop’s long history in the community. Because the shop is only a few blocks from 21c and Metropole, we walked over to our restaurant to continue the conversation over some Chicken & Gnudi, Whipped Ricotta, Quinoa Salads, bread and some aperitifs. Tony and Austin are both currently living and working in San Francisco and doing well in the food and wine business which made me wonder why they’re insistent on keeping this tiny barbershop in Cincinnati. “We just felt it was our responsibility to keep the family history going. We really care about it,” says Tony. “They just don’t make barbershops like this anymore. You could build a new one from scratch but it wouldn’t look like this. It wouldn’t have the soul. And that’s important to us,” says Austin. This isn’t to say they kept the place “as is” though. One of the nice little additions you’ll find at the Ferrari Barbershop and Coffee Co. is the coffee. Right in the window, you’ll see the beautiful La Marzocco Linea Mini espresso machine with a dozen small, faded jade-green porcelain coffee cups stacked on top. 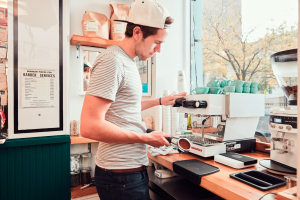 This beautiful little machine and a good connection with local roaster Deeper Roots Coffee, got the boys listed by Food & Wine magazine as one of the best coffee spots in Ohio in their 2018 article The Best Coffee in Every State. What makes this so impressive is that they don’t actually have any designated seating for the coffee customers, who need to either grab a chair with those waiting for a cut or stand outside on the sidewalk or at the small urban park across the cobblestone street. But no one seems to mind. With good coffee and young talented barbers, this small Cincinnati relic that’s been around for the better part of a century is starting to shine again. With at least one of the brothers planning to move back to Cincinnati permanently next year, you can count on hearing and seeing the Ferrari name more and more. Next up on the horizon for the brothers involves a full-service coffee shop called Mom ‘n ’em Coffee “where we’re all happy campers” dedicated to their mother, in Cincinnati’s upcoming Camp Washington neighborhood. 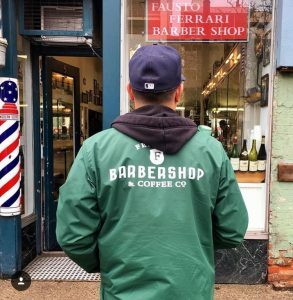 Ferrari Barbershop and Coffee Co. is located at 5 Garfield Place, Cincinnati, Ohio 45202, just a few blocks northwest of 21c Museum Hotel. You can find information about shop hours and more at www.ferraribarbercoffeeco.com.